I have a naive fondness for a few elements of the Liberal Democrats in the UK. It solely comes from the era during which it actually did advocate for less government, less intrusion of the state in both economic and personal lives and it was - at the time the Liberal Party - a real choice compared to the comatose Stalinist-lite economics of Labour and the "slowing down the inevitable trip to socialism" of pre-Thatcher Conservatives. However, those days are long gone. The Liberal Party made a convenient alliance with the breakaway Social Democratic Party, which left Labour at a time when its policies included neutrality in the Cold War and economic planning that was, seriously, barely one step removed from that of the like of East Germany. However, Labour abandoned that under Blair and the Liberal Democrats stayed still becoming a party to the left of Labour, opposing military action against Iraq and calling for higher taxes and at one point for Britain to join the Euro. Few would doubt today that the party was wrong about that, and although Nick Clegg, to his credit, decided that a coalition with the Conservatives was a better move than trying to prop up the spendthrift remains of Gordon Brown, the party has continued to show itself to be little more than the electable version of the Green Party. The one area where it could add real value, which is to reduce the surveillance state, the party has proven to be impotent and incompetent. It has defended the extension of surveillance powers to now require all telcos and ISPs to keep records of every website everyone in the UK visits, every email address they send emails to, on the basis that they already are forced to keep records of every phone call and it is just about keeping up with technology. So the British state now gets to require records kept of what you're reading, what you're looking at, what you're searching for, but don't worry - if you've done nothing wrong you've nothing to fear right? That alone should disqualify this lot from being a party with any liberal credentials at all. Its passionate love of the European Union, obsession over climate change and the "need" for unilateral British action regardless of cost and who pays that cost, and wet attitude to foreign policy and defence are little compared to the latest ramblings - which is that everyone earning over £50,000 should pay more tax because it is "fair". The Liberal Democrat's main contribution to discussion over reducing the budget deficit is not liberal in that there is no interest at all in shrinking the state. This party believes that the current 45% of GDP dedicated to state spending is about right, and the way to reduce the deficit is to increase taxes (whilst reducing taxes on the very poorest). It is pure redistributionist socialism, and it is envy mongering. Whilst early talk was of a "mansion tax" which would simply be an annual tax on the value of homes over a certain value, this has now become a tax on homes worth over £1 million. In London there are tens of thousands of such properties, more than a few owned by families or retired people who wouldn't consider themselves wealthy per se. The latest talk of those earning over £50,000 paying more should be electoral suicide. This comprises the top 10% of income earners in the UK, but notably in London it is worth saying that this is far from being wealthy. A decent two bedroom flat in middle class parts of London can cost £1500 a month in rent. Try feeling rich with £60,000 a year, after tax (which takes away 31% of that with a marginal rate of 42% on each additional pound). The Liberal Democrats constantly tout the cliche "fairness", yet that 10% earns 30% of income and already pays 50% of income tax. How fair is that? The Liberal Democrats are social democrats, and are, as advocates of the status quo and more tax, simply socialists. They are where Labour now is, under "red" Ed Miliband, the unions' choice, and given the party is keeping the Conservatives in power, deserves to be obliterated at the next general election. The big debate in 21st century politics is, once again, the role of the state. On economic policy, there is nothing liberal about the Liberal Democrats, with no interest in abolishing the absurd shop trading laws that keep London's Oxford Street closed before 11am and after 5pm on a Sunday, no interest in liberalising planning laws that mean planning permission is needed in most boroughs for the smallest of works on your own land, and a religious opposition to more airport capacity. On social policy the Liberal Democrats are uninterested in talking about laws on drugs, laws on censorship and as we have seen, are incapable of understanding state surveillance. Finally, their attempts at reform of the "constitution" consisted of trying to adopt a version of the Australian voting system and making most of the House of Lords elected with 15 year terms. The socialists of the Liberal Democrats should go to the Labour Party where they will find the usual interfering busybodies keen to create new laws, spend more money, invent new taxes and be forever committed to thinking that they are uniquely placed to know better how to spend other people's money. The liberals, wherever they may be, should go to the Conservative Party, and help it dry up and become, once again, the party of less government and more individual responsibility. For the SDP part of the Liberal Democrats have no raison d'être given Labour is no longer the home of Erich Honecker like economics, and the Liberal part has largely evaporated, in part because the Conservatives are no longer out to bully homosexuals, scaremonger about dark skinned people and fear ambitious women. Not that I have time for either of them, Labour set the scene for the current recession and for years kept a delusional paranoid megalomaniac in charge of the public finances (so deluded he boasted that he had abolished boom and bust), the Conservatives are now in the thrall of Whitehall and are led by an indecisive whim and poll worshipping pragmatist. However, the Liberal Democrats have no purpose anymore. Voters, who once saw them as a protest vote whenever Labour disappointed them, know this. In 2015 opponents of the government will mostly vote Labour, supporters will vote Conservative, there is no point in voting for a version of Labour that keeps the Conservatives in power. Yes that's what Labour's David Cunliffe and the Green Party's resident vulgarian, Russel Norman are advocating. Peter Cresswell gave some clear reasons why it is delusional as economic policy, I'd like to make it a lot simpler. Devaluing the New Zealand dollar would be the government stealing from the poor to give to the rich. How? Because those who win are exporters and those who lose are people who save cash in the bank. Those with modest savings, without stocks or shares, without the means or wherewithal to shift their money into foreign currencies, equities, gold or property, are the losers in any devaluation. It debases the cash they hold, whether it be in banknotes or bank accounts. It takes away from their ability to consume, to buy what they want if it comes from overseas or is dependent on imports as a major factor of production. It means the poor will less be able to afford an overseas holiday. It means the poor will less be able to buy a laptop or a games console or a new TV, or books that aren't printed in NZ. The winners are farmers, vintners, hoteliers and moteliers, in essence those who own export oriented businesses (or in the tourism sector) who suddenly find they can undercut competitors in other countries (or in the case of tourism attract visitors). That of course makes for another group of winners. Foreign consumers of NZ goods and services. Devaluation discounts the prices they pay, which of course is the opposite of what happens to the goods and services NZers buy from them. So there you have it. The Labour and Green Parties want to reward those who sell goods and services overseas and their foreign customers, by taking wealth directly from New Zealanders who import goods and services from overseas, and who undertake foreign travel. If you have enough money, you can open foreign currency accounts, you can shift your depreciating NZ dollar into other assets or commodities, and protect yourself from this government endorsed theft by stealth. However, if you're relatively poor, with savings largely sitting in a bank, you've had it. That's from the parties who, like attention seeking poseurs, are pretending to live like poor people to highlight how tough poverty is. They want to take from the poor to give to the relatively well off. Why? Because their entire philosophy is to intervene, to do something, because they know better than the millions of people making individual decisions about what to buy and sell and at what prices, because they are uniquely blessed with greater knowledge, so they can debase the wealth of some to better others, so they look like they've done something good. They're not. They are ready to steal by stealth. Don't let them. Labour, Greens, Maori Party and Mana all share this view of racism. The post-modernist structuralist view of reality is that which carries the mainstream of academia in universities in the English speaking world. It is what most of our leftwing politicians were raised on, and it is what causes them to believe that a fairly simple concept - racism - is not simple at all. Racism is, from a classical liberal definition, the belief that another person is inferior (or superior) purely because of that person's racial heritage. It is taking those physical characteristics to judge that person. Racism is irrational and has been the source of countless bloodbaths in history, and remains a primal drive within humans that overrides the rational faculty with fear and loathing of "the other". Objectivists consider it antithetical to individualism, which judges people on their behaviour and ideas, not their heritage. Ayn Rand said as much herself. Yet why do some say that non-white people can't be racist? Well it has been eloquently explained by the Socialist Worker - the British Marxist newspaper which demonstrates that once you have put everyone into silos - then you can label them any way you wish. Consider for a moment the irony of those who claim to be against racism using the very same techniques as those they oppose to classify others and then to seek to initiate force against them on that basis.
" the idea that black and Asian people can be racist towards white people is wrong. It confuses a reaction to a racist society with racism itself. It is true that black and Asian people sometimes respond to racial discrimination by saying that all white people are part of the problem. Some say all whites are inherently racist. They may even make crude jokes to this effect. These ideas can impede the fight against racism. But they are not themselves racist. Racism is more than simple prejudice, no matter how ugly or unpleasant. It is the combination of prejudice with power. It occurs when a group of people are discriminated against because they are seen as inferior." There you understand it, you are not racist if you are black and treat someone who isn't black in a negative way purely because of that person's race. Why? Because the racism isn't expressed by individuals' reactions, but by those actions with power. Power from the Marxist structuralist perspective is purely binary and is extracted from the bourgeoisie-prolertariat dichotomy that Marx and Engels propounded, but adjusted to fit the post-colonial narrative invented by academics. "The vast majority of people, black or white, aren’t in positions of power. Yet most of those who hire and fire staff, and make and implement policies that affect the lives of millions are white. This, in the British context, is deemed to be because of racism. Not to deny that it didn't exist officially and unofficially on a considerable scale when most of those migrants' ancestors arrived, but it is taken as given that position that this is the sole reason. Many among them hold racist views and they are given a chance to put their prejudices into action. And it’s not just racist individuals who discriminate—the capitalist state does too. So it is now asserted that "many" who hold power, who are managers in business hold racist views. No need for proof, it is "fact" and recirculated as such. Then the state does so too. Again, who would deny there are always a number in the Police and other institutions who act this way, but then the "capitalist state" disproportionately hires people of minorities as well - yet if they acted in an objectively racist manner in hiring, that would be "ok". It is for these reasons that darker-skinned people are more likely to be out of work, in poor housing and the victims of racist policing. They are at the bottom of a racial hierarchy. Again, just a bold assertion. If a manager doesn't hire the black candidate for a job it is racism, not because the candidate might not be the best candidate available. Another assertion is this "racial hierarchy". It isn't one created by the state, or even businesses, but one that is created to fit the post-modernist Marxist view of race. If a white person argues that all black people are illegal immigrants they are using racist ideas to side with the powerful against the oppressed. Really? Which of the powerful argue that all black people are illegal immigrants? Who outside the nutty fraternity of the National Front claim such nonsense? It's just an inane racist comment. Racism runs deep in capitalist society because it is such a crucial component of the system. That’s why black and Asian people can accept racist ideas about themselves and other oppressed people. Now we are really into the fantasyland thinking. If you think racism is a critical component of capitalism, you'll hate capitalism, yet racism isn't only irrelevant to capitalism it is antithetical to it. For racism is fundamentally irrational, and it involves treating individuals not on their talent, intelligence and abilities, but their backgrounds. Businesses that write off people on that basis are losing opportunities for talented staff and management, but would also be incapable of developing and marketing products for people, because of racism. The most systematically racist states in the world have been fascist-socialist constructions that have had capitalism under their jackboots. Leftwing parties almost universally advocate the state undertaking activities based on the "affirmative action" model following the philosophical contortions expressed above. If you are Maori, Black, etc, you are deemed to automatically fall into the oppressed proletariat category, so state sponsored scholarships, loans, grants and programmes, including quotas for employment, are deemed to be "correcting" the racism you have endured. Blank out if you are actually a high income professional or son/daughter of such a professional (the people typically most able to take advantage of such programmes). Statistics of poor economic, health or educational performance are deemed to be "because" of racism, for any other explanation is inconvenient (and it is racist to even search for alternative explanations). If you seek "one law for all" or to end racially determined institutions or programmes, you are "racist", because you don't understand that the state is racist and needs to be racist to counteract its own racism. Yes, the racist state needs to be racist (which isn't racist unless it is expressed by the powerful, which the state is) to not be racist. Of course in the 1930s in Germany, the state saw that there was vast racism in the management of business and government in the form of one race that ran everything and was seeking to dominate and enslave the race it saw as inferior. That was swiftly addressed of course, and naturally few today would claim that the success of Jews in pre-war Germany was because of racism (indeed to some extent, in spite of it). So is it not time to intelligently take on the post-modernist structuralist view of racism and the state in the developed world, and to do so by identifying exactly what are the sources of the disparities in outcomes that get labelled as racist by the baying mob of power hungry politicians on the left? Could it be that cultural attitudes among communities regarding education, entrepreneurship, risk-taking, esteem, individualism, violence, the value of tight safe secure family structures, saving and aspiration are really what matters? So let's imagine that a low ranking Cabinet Minister in the UK, or Australia, or Germany, or Japan, or a Secretary of the US Administration said he would pay a fortune to murder a civilian national of another country - even though that national had not committed a crime in his own country, nor had done anything other than to offend that Minister. You see, the Pakistani Railways Minister can do it. Although the Pakistani government has made it clear that he doesn't speak for the government, that doesn't mean a blind eye should be turned. The response to that should be clear and unequivocal, especially from those countries that use their taxpayers' money to spend on aid in this misogynist hate filled cauldron of vileness and sadness. Ghulam Ahmad Bilour should be fired. If he isn't aid will cease. Regardless, this man should now be banned from entry into the United States, the European Union, Australia and New Zealand. Politicians as much as anyone should not feel free to commission contract killings. However, I fully expect there to be plenty of hand wringing because removing Bilour would risk collapse of the Pakistani coalition government because he belongs to the small Awami National Party, which is a socialist party with no strong Islamist credentials and only 2% of the votes at the last election meaning it is a small partner in a shaky coalition. Pakistan officials will no doubt say that firing a Minister for such a comment will risk an Islamist backlash that could see the government folding and a new election resulting in an Islamist government being elected - a risk that isn't particularly likely given Pakistani politics are relatively Islamist as it is, and there is no strong Islamist party in the country (the largest coalition of such parties only gained 2.2% of the vote in 2008. Still, it is surely an opportunity for the Obama Administration to make it clear that these sorts of threats will not be taken without consequences. The Fraser Institute - a Canadian libertarian think tank - has produced a fairly comprehensive assessment of the ranking of about two-thirds of countries on the basis of economic freedom over a wide range of indicators. It produces it every year. This year the story it tells is of a world where economic freedom is still correlated to wealth, but also relief from poverty and, despite the scaremongering of the left, proportions of wealth owned by the poor relative to the rich. Peter Cresswell pipped me to the post in writing about it, describing why economic freedom means more than just wealth, but also wealth for the poor (who are many times better off in free economies) but I thought it deserved a longer review. - Size of government: This includes the extent of government consumption, levels of transfers/subsidies, the share of government presence in the market as an owner and investor in business and top tax rates. No doubt socialists would regard this as being an invalid measure of success or failure, as they would see a large state participant in the economy as positive. - Legal System and property rights: Independence of the judiciary, impartiality of courts, protection of property rights, military interference in rule of law, integrity of the legal system, enforceability of contracts, restrictions on sale of land, reliability of the police and the business costs of crime are included here. I'd have thought most of these would be seen by even those on the centre-left as being critical components of any good state. - Sound money: Measures here include growth in money supply, inflation and freedom to hold foreign currency accounts. Of course those of us who believe that fiat currencies are fundamentally flawed wont be satisfied, but it is a good measure of the management of a key policy that can be so destructive to the wealth and savings of the vast bulk of the population of a state. - Freedom to trade internationally: Tariffs, regulatory barriers to trade, the usage of black market exchange rates and controls on the movement of capital and people (including travel restrictions) are all considered here. Again those on the left would be supportive of restrictions on many of those points. - Regulation: Regulations on bank ownership, credit and interest rates. Labour market regulations ranging from hours of work to conscription, and regulations on starting, licensing and tax for business are all included. It also measures the need to pay bribes. Once again, those on the left would be keen to have more of most of these. The full report is here, and I'll leave it to others to do a more depth distillation of specific results, but for me there are some notable trends and statistics. Hong Kong and Singapore are the top two, followed by New Zealand. Yes NZ is number three, the freest "proper" liberal democracy. It shows both how far NZ came in the 1980s and 1990s, but also how far others have not come. Australia is fourth, but the UK is 12th and the USA 18th. The last of those should be a clarion call warning to Americans who believe in capitalism that warnings about Obama making America like Europe are optimistic - for six European countries are more free, economically, than the USA. It is noted the US was ranked 2nd in 2000, and fell to 8th in 2005. No sign of Bush "neo-liberalism". In Europe, Switzerland tops clearly, at 5th, Finland at 9th, Ireland at 12th equal with the UK, Estonia 14th and Denmark at 16th. Of the other big European economies it is telling that Germany is 31st (below the likes of Sweden and Austria), Spain 34th, France is 47th (barely above Poland but behind Albania - yes Albania), Greece is 81st, Italy is 83rd, all beating Russia at 95th. Ukraine is the worst in Europe at 122nd. In the Americas, Canada is 5th equal with Switzerland. Yes, more economic freedom north of the border. Chile soars ahead of the rest of the Americas at 10th. Mexico 91st, Brazil 105th, Ecuador 126th and Argentina 127th. Venezuela naturally is 144th (bottom rated of those measured). In Asia, Taiwan gets 15th, Japan 20th and South Korea 37th. China 107th. India and Pakistan both 111th. Myanmar is bottom in Asia at 143rd (yes I know another would be worse). In Africa, the best performer is Mauritius at 8th, but then it is a long drop to Rwanda at 45th. South Africa is 85th. Most of the bottom rated countries are in Africa, still, with Zimbabwe at bottom on 142nd. The Middle East has Bahrain topping at 7th, proving that economic freedom does not necessarily mean political freedom. UAE is 11th and Qatar 17th. Algeria is bottom of the Arab world at 137th, with Syria at 119th. Israel is 52nd. What of New Zealand's ranking? NZ might be third overall, but it is 95th on size of government (95th smallest out of 144), which shows how highly ranked NZ is on most other measures. Yet NZ was ranked far more highly on size of government recently. In 2009, the year after the current National led government stopped the Helen Clark juggernaut, it was ranked 73rd on size of government. So National has led the growth in the state, relative to others. Of course Labour achieved a lot on that front, as NZ was ranked 47th freest in 2000 just after it was elected, but that's a far cry from 1995 when it was 18th. You can thank Jim Bolger, Jenny Shipley and Winston Peters for that. You can go further back and see Ruth Richardson saw NZ rise from 66th to 18th in five years and now drop to a ranking last seen in 1985 when Roger Douglas was only starting to unwind Muldoonism. Beyond that measure, NZ's score on legal system and property rights has slipped a little from a high point in 1995, although it would be interesting to probe into the detail behind the scores here (and elsewhere). On sound money it remains about as highly rated as it always has been. However on freedom to trade internationally it is now scored the lowest since the 1980s, with compliance costs on trade, foreign investment limits and limits on capital flows reducing the score. The overall regulatory score is the best it has been since it has been measured, but on labour market regulations NZ is ranked 9th, its lowest ranking besides size of government. So what does this mean? Simple. Any claim this National-led government is implementing radical free market reforms falls flat on the evidence - it has grown the state. In relative terms, NZ has been retreating from such reforms for around 17 years now. The state grows faster under Labour, slower under National. Yet despite slipping on some measures, especially size of government, NZ ranks well largely because others have slipped as well. It becomes more apparent if one looks at key comparators like Australia, the US and the UK. 62nd in size of government, 66th on freedom to trade (a lot of protectionism), 29th on monetary policy, 11th on regulation overall, 13th on legal system and property rights. Australia is 4th overall still, which is still the best position it has ever had. However, under that Australia has slipped on size of government (had been 47th in 2009), slipped on legal system and property rights (was 3rd in 2000), slipped on monetary policy (10th in 2009), plummeted on freedom to trade (was 19th in 1990 and has slipped since, mainly because others have moved faster) and slipped a little on regulation (was 8th in 2009). Disturbingly one area Australia has slipped back on is bribery. Capital controls are also severely restricted. In essence, Australia slipped back on protectionism some time ago, but the end of the Howard administration has been characterised by ongoing slippage in economic freedom. Not entirely surprising, as this has been shrouded by the bubble of mineral prices that politicians have been riding on. 117th in size of government, 41st on regulation, 19th on monetary policy, 15th on legal system and property rights and 5th on freedom to trade. The UK has slipped badly in recent years as it was 5th overall as recently as 2005, being 12th today. How has it dropped? It was 58th on size of government in 1990, just after Thatcher had resigned. It has fallen steadily since 2000. The legacy of the spending and regulatory measures taken after Blair won a second election is what is now apparent, with the Gordon Brown years particularly reducing economic freedom. The hysteria over the barely apparent austerity (which is simply slowing the growth in spending) is just that, and the big emphasis now ought to be cutting the size of the state and regulation - but it's unlikely to happen under a Conservative coalition with a schizophrenic leftwing party. 73rd on size of government. Yes 73rd! 57th on freedom to trade. 31st on regulation. 28th on legal system and property rights and finally 7th on sound money (really??). Where has the US come from? It is 18th overall now, but was 2nd as recently as 2000. By 2009 it was 15th (yes you can thank Bush for that) and the slide has continued under Obama. On size of government it has dropped from 24th in 1990 to 73rd now, consistently. That's through two Bushes, Clinton and Obama, and Congresses dominated by Democrats and Republicans. On legal system and property rights it was 1st way back in 1980, yes before Reagan. It slipped through to 1995, improved a little for 2000, and then kept slipping back, although is slightly better now than it has been since 2005. In 2005 it was top for sound money, but it is no surprise that that has slipped with the printing presses. Freedom to trade was once 7th in 1980, but has slipped back almost consistently since then - globalisation? No, the US hasn't kept up with that. The slide has been particularly intense since 2005, but Obama has never been a friend of free trade. Finally, the US was once 2nd for regulation in 2000. It has plummeted since then to 31st, notably it was 24th in 2009, showing once more that Bush was hardly a small government President. Republicans in the US often talk about how they don't want to be like Europe because it is so socialist, but they need to look at themselves. The US ranking on so many measures is worse than several European countries. On size of government, Albania, Bulgaria, Lithuania, Moldova, Romania, Switzerland and Ukraine are all smaller than the US. Yes, Albania, once the last bastion of true believers in Stalin. This should blow any claims that the US is the bulwark of economic freedom of the world - it quite simply isn't. On size of government Madagascar gets the best rating, but given every other rating is 92nd or worse than 100th, it isn't really a fair indicator, much like Bangladesh at 3rd (which more shows an inept state rather than a good small one). Hong Kong is 2nd though. At the other end of that ranking, Algeria at 142nd sits near the Netherlands at 144th and Sweden at 143rd. Big states that are offset by good legal systems, protection of property rights and lower levels of regulation. Legal system and property rights ratings are more consistent. Finland is 1st, NZ 2nd and Denmark 3rd. Every other top 10 country is either western European, Singapore or Hong Kong. At the bottom are the likes of Venezuela, Haiti, DRC and CAR. All other below 100 rated countries are developing countries in Africa and Asia, including the likes of Argentina. On monetary policy the leaders are the likes of Japan (yes really! ), Portugal, Albania and the USA. Bottom rated are Zimbabwe, Venezuela, Angola and DRC. Still I've little confidence that monetary policy deserves a high rating anywhere nowadays. On freedom to trade internationally, the best rated are the likes of Singapore and Hong Kong, UK, Uruguay, Guatemala, Ireland, Peru, Netherlands and NZ. Not a consistent lot, but showing different levels of openness. At worst it is Venezuela, Iran, Myanmar and DRC. India is also ranked poorly at 114th, not great for a country seeking to emulate China (which itself is 104th). Russia is 127th, but oddly Iceland is 118th! A lot depends on what is protected and size of the domestic economy, obviously Singapore and Hong Kong would not thrive being closed economies. Finally on regulation, the best rated are Hong Kong, but then Fiji, NZ and Singapore. At bottom is Algeria, Brazil, Myanmar, Venezuela and Zimbabwe. One wonders if Brazil can sustain growth with such a tightly regulated economy. The big picture is that for much of the world economies have been subject to more government regulation in recent years, as the automatic response to a financial crisis caused by central bank fueled credit bubbles and exacerbated by fiscal incontinence has been to regulate more, engage in more central bank incontinence and to do little to substantially shrink state spending. So let's stop talking about austerity. In Greece, the only dimension that has ranked well as of late has been monetary policy - the rest have been the measures of a state dominated and regulated economy. The broad indicators of a sound economy come down to a robust legal system that protects property rights and reasonably sound monetary policy. Beyond that, the more regulation and more trade restricted the economy, the less likely it is to grow or to deliver better results for the poor. There is a lot of further analysis that could be done of these figures, particularly trends in GDP growth, GDP per capita and changes in rankings over time. Of course this is all based on scoring which is not particularly transparent. Herein lies the difficulty in making more than broad based interpretations of the report. Anthony Randazzo of the Reason Foundation explains why money printing quantitative easing ought to get the socialist Occupy movement out in the streets. Which of course wont happen, since their pinup economist - Paul Krugman - is a fond believer in printing more money and spending more money the state doesn't have, to boost the economy. No doubt some Democrats will think this is a cunning move to give the US economy a boost before the election, as some Republicans think this also, and are criticising it on that cynical basis. That isn't a reason to criticise it, because it is unlikely to make enough difference to enough people to have an electoral impact. You see you have to ask the question as to who benefits from the creation of new money and who loses. Bearing in mind Bernanke has said he will create US$40 billion out thin air, every month, until the economy recovers, this matters. It's also why the price of gold took a big hike overnight. The beneficiaries are those whose securities the Federal Reserve is now going to buy with its new money. Those will include the securities holding debt to the Federal Government or mortgages. So the immediate winners are investors in those securities who now have a willing buyer. With such purchases, the recipients are the financial institutions who now have money to reinvest. So it is the shareholders of those institutions who immediately gain from money printing. The next beneficiaries are those owners of securities, stocks and bonds that gain such investments, as they suddenly find there is more money available to invest. Prices for stocks and bonds will rise, so existing holders of them benefit. Those who own such stocks and bonds are going to be primarily other institutions or wealthy individuals. People who are also aware of the counter-risk of money printing - inflation - and so are able to take steps to protect themselves from what inevitably becomes a new round of malinvestment. Why malinvestment? Because the flow of "free money" will see choices made that are dependent on what securities the Federal Reserve buys. The Federal Reserve will want to sweep up government debt and mortgage securities because they are seen as low value investments, so that there is a preference for stocks and shares. However, with investors having low confidence in the economy, many also sweep into commodities, because they see any scope for rising demand being seen in rising prices for commodities. So a speculative bubble emerges, with those who joined at the start - those who gained from state purchases of their securities, gaining the most. Whether it be energy, food or minerals, another round of malinvestment will create a bubble. That's where we find the losers. For the consumers of such commodities, be it in purchasing food, heating their homes or even building materials to fix or extend their homes, they face inflation, and as that grows it means their purchasing power declines. With virtually zero interest rates, it means savers lose out as with growing inflation, they find they are fighting a losing battle. They can choose to hop onto various speculative bandwagons, but know it is high risk. So they mix between commodities, stocks and shares, property and various other equities. Those who already had property theoretically benefit, but few are likely to realise this gain unless they sell at the right time and convert their depreciating currency into another investment. Of course for those who largely live on receiving an income, they face inflationary pressure with little hope of relief unless their field of employment can afford to raise their wages. Those who are saving to buy property or indeed anything, are on a losing streak. In short, what is called quantitative easing, which is a euphemism for printing money, benefits those who the Federal Reserve buys securities from the most, and actively harms those who are poor, who don't own property or whose savings are primarily in bank deposits. Will it work? Well Randazzo believes that private debt levels remain so high that most people are simply concentrating on reducing their levels of debt, rather than seeking to invest. So whatever trickles down is likely to be used on that. 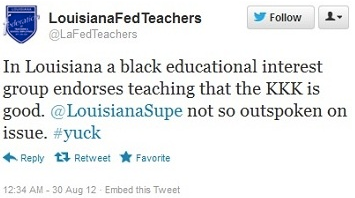 So says the Louisiana Federation of Teachers. 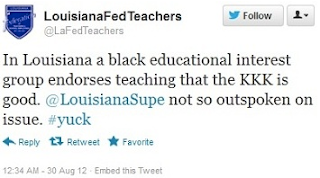 The American Federation for Children (a lobby group promoting educational voucher programmes and tax credits to enable parents' taxes to follow the school they want their children to attend) reports that the Louisiana Federation of Teachers, an avowed opponent of school choice (presumably because it breaks their dominance of the profession and the single shop approach to negotiating pay) has tweeted that the Black Alliance for Education Options (BAEO), a group of African Americans who also support education vouchers/tax credits for private schools supports teaching that the KKK is good. Yes. A pro-Democrat, leftwing union claimed a black educational advocacy organisation endorsed the teaching of racism. Because some private schools enrolled in the program reportedly use texts that may attempt to downplay the awful history of the Ku Klux Klan, LFT (via twitter) called BAEO a "black organization that supports KKK vouchers." This is not only the most ludicrous description of our organization but it is also one of the most unintelligent. We unapologetically stand for parental choice. That doesn't mean that we believe every private school is great or that private schools are better than public schools. It simply means that while serious people go about the difficult and long-term work of trying to reform low-performing traditional public schools, we must also give parents real options that allow their children to get a quality education today. We trust that parents, when given the option to choose and when armed with accurate information, will make increasingly better choices for their children. What I see is an interest group adopting any technique it can to smear those presenting options that threaten their position of privilege and lack of accountability. The idea that a state monopoly on education and restrictions on access to schools only in a local area is good for children or what parents want is ludicrous, and it is little short of disgusting that teachers' unions - whose primary interest is to increase the pay, reduce the workload and reduce the accountability of teachers - continue to prey upon the vulnerable, weak and poor to demand that they maintain this monopoly on teaching their kids. They fear new schools, dynamic ones, ones that pay teachers on performance, that hire teachers that aren't unionised into their collective gang, and that parents like them. They fear not being able to lobby politicians to decide what those schools teach or what they should be paid. They fear that, when given their own money back or given a way to transfer their taxes from public schools to other options, that they wont choose the options the teachers want monopolised. They'll find every example they can of non-public schools not delivering the best performance, whilst ignoring the same of their monopoly schools, they will constantly claim that it's all about the children, that this is all they care about, all the time implying that they and the state knows best, not parents. Nothing is more important in pushing freedom and changing the culture of modern liberal democracies today than taking schools out of the hands of these peddlers of protectionism, hatred and statism. That's why they, and their friends in politics (e.g. the Green Party in NZ), are so keen to oppose them. For they argue private schools should remain for the rich, for the poor kids shouldn't get to go to a school which declares that individual achievement and excellence are the primary goal that should be strived for. After all, what could be worse that kids from backgrounds that can't afford to pay taxes and private school fees, stand up and proudly live lives that aren't about dependence. I've spent the last month or so basking in what truly was a magnificent time to be in London. It was, on two occasions, a centre not of banal cultural emptiness, not of history shrines and hoards of tourists eager to look backwards, not of a sub-culture of misogynistic violent no-hopers eager to pillage and destroy in anger at their own uselessness, not a centre for Islamist horror, but of individuals as elite athletes, whether Olympic or Paralympic, striving and winning, and in a culture that truly glorified and celebrated them. Whilst Team GB got by far the greatest attention, there was never an ounce of resentment or denial of the wondrous successes of those from other countries, the remaining malignant nationalism that comes with the Olympics (and which China still pushes), was not apparent. It was truly a celebration of the achievements and efforts of thousands of individuals, it saw a mood of benevolence and patience, as both the cost and the draconian approach to branding were largely ignored, and people celebrated. Yes, I wish it hadn't happened because it was destructive of wealth (proven also by July seeing a drop of around 200,000 overseas visitors and drop of spending by visitors of around £120 million compared to the previous year) and a travesty of a waste of money, but it did come with that beautiful element of human beings striving, succeeding, proud of success in any form (whether it be medals or personal bests), and others genuinely celebrating in their success. The bubble of that culture has been well and truly popped. One minor event was at the Trade Union Congress, where t-shirts were being sold that said that when Thatcher dies a generation of trade unionists will be dancing on her grave. It was being sold by the Derbyshire Unemployed Workers' Centre, which itself is part funded by three local authorities. All of the nastiness of Marxism epitomised in one product, and whilst the TUC condemned it, Labour leader Ed Miliband chose to remain silent. However, that minor piece of disgusting behaviour is nothing compared to the true travesty of justice over Hillsborough. David Cameron has apologised for the vile behaviour of the South Yorkshire Police and the emergency services, not just for their grotesque negligence that apparently allowed as many as 42 of the 96 who died in that tragedy to die unnecessarily, but their lies, manufacturing of evidence and perverting the course of justice to cover up their own ineptness. This conspiracy by agents of the state to cover up their own failings is not just disgusting, but criminal. There should be people charged for acts which, if they were private citizens, would see them in prison for many years. Altering statements and editing evidence to conceal failings is palpably inexcusable. Many in police forces wonder why people don't trust them, why they are antagonistic or obstructive, it is because of this sort of activity. The willingness to flagrantly act without good faith. Finally, it looks like a badly made film lampooning Islam and making it out to be a religion of violent bigots, has incited lots of groups of Muslims to act as violent bigots. Those who think that the act of private citizens in a country is the act of a state, those who believe that the appropriate response to being offended is violence. Meanwhile, the US is led by an Administration which has as its first response is to sympathise with those offended, whose Secretary of State condemns the film as disgusting and reprehensible (as well as condemning the violent reaction to it). America will not tolerate attacks against our citizens and against our embassies. We will defend also our constitutional rights of speech and assembly and religion. We have confidence in our cause in America. We respect our Constitution. We stand for the principles our Constitution protects. We encourage other nations to understand and respect the principles of our Constitution because we recognize that these principles are the ultimate source of freedom for individuals around the world. When was the last time you heard a major party US Presidential candidate standing explicitly behind free speech and freedom of religion? When was the last time that you heard one talk about those principles being a source of freedom for individuals around the world? Where is the stereotypical theocratic authoritarian that is the caricature that Democrats want to paint him to be? What exactly could anyone of a classically liberal (not socialist liberal) bent oppose of that statement? Thomas Szasz passed away last weekend. He was a prolific writer and critic of psychiatry. He was vociferous in his view that so much of psychiatry was not scientific at all, and was rooted in social and political beliefs that when people behaved in ways that were unacceptable that they were "ill". He only saw illness in those who had physiological attributes of brain damage or disease, whether they be congenital, infection, stroke or accidental, not in conditions that were diagnosed with no signs of such damage, such as depression and schizophrenia. His famous quote was. "If you talk to God, you are praying; If God talks to you, you have schizophrenia. If the dead talk to you, you are a spiritualist; If you talk to the dead, you are a schizophrenic"
He was highly critical of the use of drugs to "treat" perceived mental illness, looking to ECG and lobotomy as previous coarse and even inhumane exercises in curing behaviour. He talked of how women who didn't act as were expected were deemed "hysterical", about attempts to cure homosexuality through surgery. This and other attempts by psychiatry to diagnose and treat people reflected more about the context of social norms of the day as to what was "acceptable" behaviour, than to actual disease. He saw incarceration used more and more as a means of control than to protect people from those who would behave badly, as few people deemed to be mentally ill commit criminal acts upon others. He rejected the defence of insanity as being an abrogation of personal responsibility, and believed the defence should not exist. He wanted people accountable for their behaviour which it denied the rights of others, but he was a stalwart defender of the rights of others to live their lives as they saw fit, as long as they did not interfere with others doing the same. He thought of psychiatry as a profession full of people bent on control, and indeed the film One Flew Over the Cuckoo's Nest was in part inspired by Szasz's observations of the profession. He saw some diagnosis of mental illness as denying people responsibility for their own behaviour meaning they could have control of their lives taken over by professionals, only too keen to medicate, incarcerate, electrocute and operate. Psychiatry loathed him. He was a libertarian. He was no fan of psychotropic substances or narcotics per se, but he loathed the war on drugs and loathed depictions of drug users as all "addicts", and believing that the state's treatment of drug users created far more harm than they ever did to themselves or others. Reason has a good obituary about him, along with a series of links to articles, some supportive some scathing. However, for me Szasz has the status of a man who confronted power, who confronted orthodoxy and did so despite being excoriated by them, for whilst he was not always right, he was not meek. For who can pick up a copy of the "The Myth of Mental Illness" and not be rattled by the title, and not consider that the term itself has been used, so very much, to simply describe people who are having problems living.